Patrick Kho is the Group Managing Director of Lian Huat Group. Patrick read Electrical and Electronic Engineering in St John’s College in the University of Cambridge and graduated in 1988 with a BA degree. He subsequently obtained a MA from the University of Cambridge in 1991. Patrick is also a Chartered Financial Analyst. A Singapore Armed Forces scholar, Patrick served his scholarship bond with the Singapore Armed Forces until 1996 when he left to join Lian Huat Group. 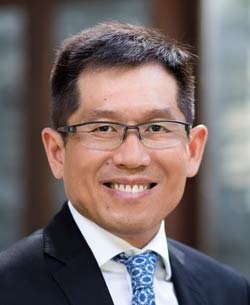 During his 12 years military career, Patrick served in various combat and staff leadership positions in the Republic of Singapore Air Force such as commanding Air Defence Artillery missile units and heading the air force manpower planning and policy as well as the development of air force training. As the Group Managing Director of Lian Huat Group, Patrick manages the Singapore property development and investment businesses as well as the group’s property investments and hotel businesses in Australia and China. In recent years, he spearheaded property development projects in Singapore with a Gross Development Value (GDV) of more than S$700m. He is also a non-executive director of ASX listed LionHub Group Limited as well as ASX Listed Land & Homes Group limited. Patrick and his family actively engages in social responsibility and philanthropic causes. In addition to the numerous ad hoc projects that he supports, he is a strong supporter of Vision Fund International, a Non-Government Organisation that improves the lives of children in the developing world such as Cambodia, Myanmar, Sri Lanka and the Philippines by offering small loans and other financial services to families living in poverty. Patrick is a Council Member and Vice-Chairman of Singapore Road Safety Council which comes under the auspices of the Ministry of Home Affairs Singapore. He is also a Director of St John’s Cambridge (Singapore).